Throughout July and August, many incoming Samford University new students and their parents have the opportunity to attend a summer send-off party. There are 15 celebrations planned in locations across the U.S., starting in Mobile, Alabama, and ending in Birmingham. There also will be send-off parties in New Orleans, Louisiana; Jackson, Mississippi; Orlando and Tampa, Florida; Memphis, Nashville and Chattanooga, Tennessee; Louisville, Kentucky; Atlanta, Georgia; the North Texas area; Houston, Texas; Charlotte, North Carolina; and Huntsville, Alabama. "Students and parents in a close geographic area can meet and get to know each other. 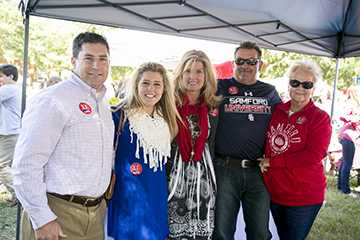 It's another way to build relationships and build community," said Susan Doyle, Samford’s director of parent programs. The celebrations are casual get-togethers and meals where students and parents can ask last-minute questions before move-in day. Representatives from the university will be there to answer questions and oversee the events, Doyle said. “So, our theme is ‘out of many, Samford,’ celebrating the fact that students are coming from so many places to Samford and become one at Samford,” Doyle explained. Themed T-shirts will be sold at the celebrations to be worn on move-in day. The design is a map of the U.S. with the student’s home state highlighted in red. Samford students come from all around the world, Doyle added, and the send-off celebrations are another way for students to meet others in preparation for the start of the school year in August. Register for a send-off party.